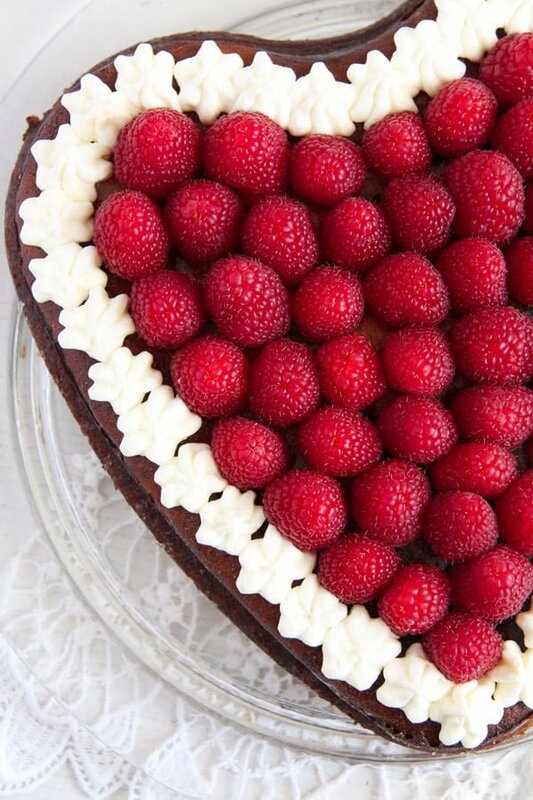 Amazing crustless cheesecake topped with fresh raspberries and whipped cream – a beautiful and delicious cake for Valentine’s Day. 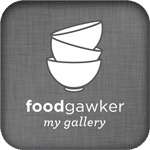 This is the recipe for one of my favorite cheesecakes, a recipe that I have already posted last year: The Quickest and Most Delicious Crustless Cheesecake. But then I decided to make it again for my husband’s birthday in January. He loves cheesecakes as well, more than he likes other sorts of cakes, so I thought I could make it happy with this. Initially, I have intended to decorate the cake the same way I did the first time, that is topped with only whipped cream. But then I went shopping and saw these magnificent, large raspberries! They looked so perfect, like jewels almost, I had to buy them. 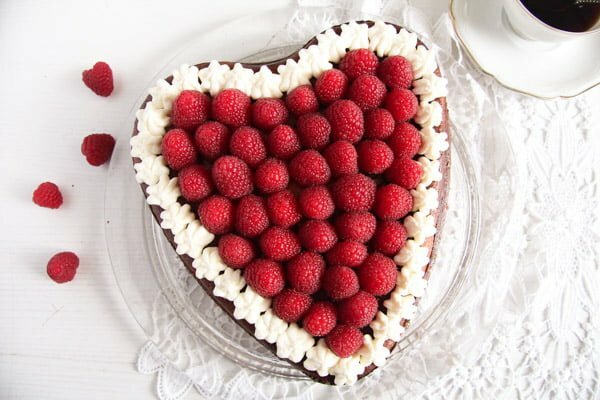 And immediately I knew I will bake that crustless cheesecake in a heart-shaped springform and top it with those wonderful raspberries. 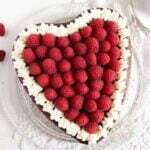 Well, I was wrong: the Heart-Shaped Cheesecake with Raspberries and Whipped Cream version is even better! Preheat the oven to 170 degrees Celsius/ 340 degrees Fahrenheit. Butter a springform 26 cm/ 10-11 inch and set aside. Give the quark, heavy cream, Smetana/creme fraiche, eggs, very soft butter, sugar, vanilla sugar, flour, baking powder and lemon juice to a large bowl. Mix well. Pour the mixture into the prepared springform. Place a piece of baking paper loosely on top of the cheesecake and bake for 1 hour without opening the oven during this time. After one hour turn off the oven, still do not open the oven, and leave the cake in it for another two hours. Remove from the oven and cool completely before taking out of the springform. Top with the whipping cream and raspberries just before serving. Beat the whipping cream with the cream stabilizer and vanilla sugar. Read the package's instructions of your cream stabilizer. I use Dr. Oetker: I beat the heavy cream until it starts to stiffen, then slowly add the sugar and the stabilizer. I continue beating the cream until stiff, it will not take long. Give the whipped cream to a piping bag and pipe the cream around the edges of the cake. 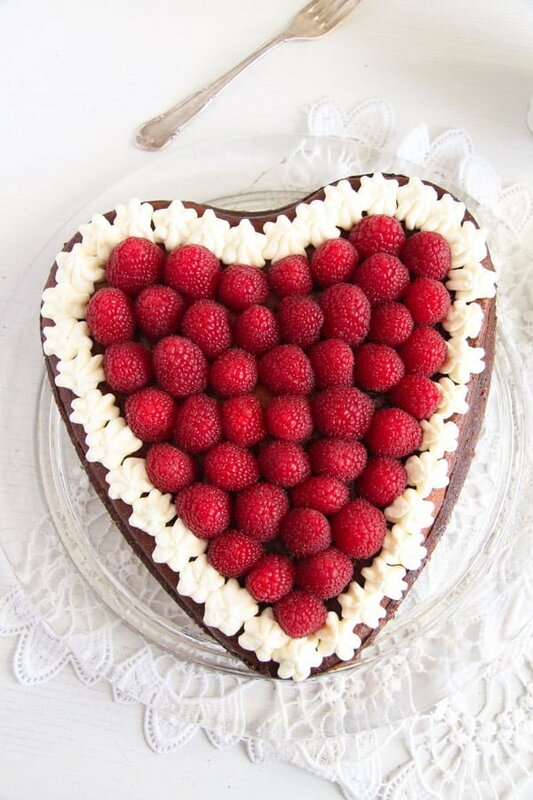 Arrange the raspberries on the cake inside the whipped cream frame. I generally find that cheesecakes taste even better the day after baking, so I actually always make them one day in advance, but only top them shortly before serving. This cake sounds and looks delicious. And those fab raspberries… I would love to try it. Adina, I don’t celebrate Valentine’s Day – but this GORGEOUS cheesecake is making me rethink my Valentine’s Day shenanigans! 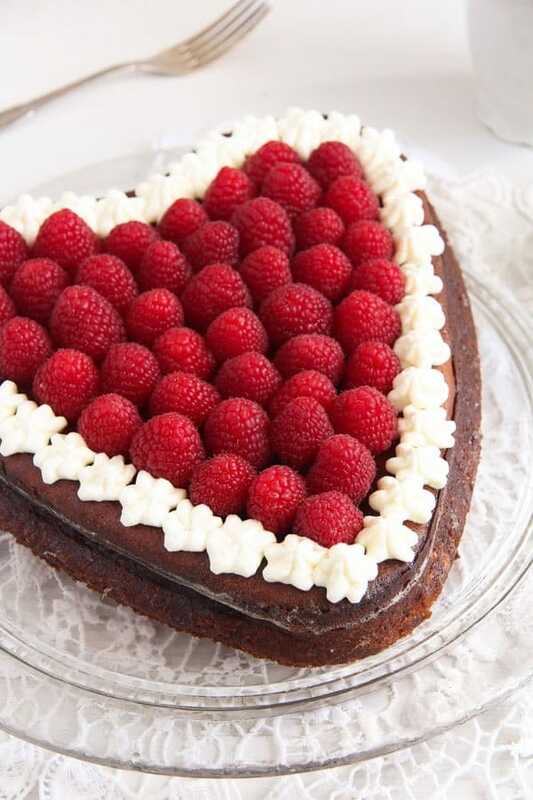 What a stunner – those large raspberries look so good too! I wish my husband ate cheese….this looks stunning with fresh raspberries. Stunning.. i am already in the celebration mood..